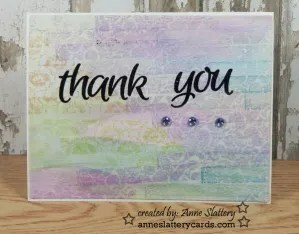 Challenge #2 from Michelle is to make a thank you card. She also upped the ante by challenging us to use spray inks. Sorry no spray inks here but I did use inks and embossing. Stamplorations Eclectic Florals (embossed in white) and Floral Strip stamped in MFT Grape Jelly on Grape Jelly cardstock. Stamplorations Sentiment Thanks Builder. 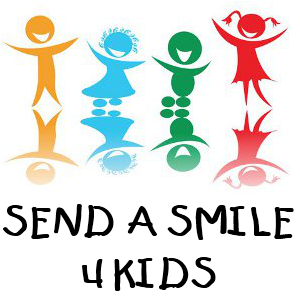 Challenge #3 is from Kelly at A2Z Scrapbooking. Kelly challenged cardmakers to make a kids birthday card and use the paper piecing technique. Recollections stamp (Don’t Bug Me); Martha Stewart icicle punch (turned upside down) for grass; MFT Woodgrain Background Stamp; Just Rite Sentiment (Hugs and Kisses) Inkssentials enamel accents on the antennae. All papers are scraps. Challenge #4 is from Lori to make a Red White and Blue Birthday Card. Recollections stamp (Doodle Birthday) colored with copics. Papers are all scraps on the reverse side of a navy cardstock I messed up on; Happy Birthday stamp and die are from Stampin’ UP. Challenge #5 is from Beth. She challenged us to make a colorful background. This doesn’t look very colorful because of the soft colors but it is nice up close. Stamplorations Floral strips stamped in various colors of green purple blue and kraft. Sentiments is also from Stamplorations thank you builder sentiment set (I love these sentiment builders) embossed with Zing opaque black embossing powder. Three little gems for accent. Challenge #6 is from JoAnn. Make two winter cards one for Christmas and one for the winter season. I used a Darice EF (ornamental star) and stamped be merry, be joyful and Merry Christmas from Stamps of Life (lights4christmas). This is a clean and simple one layer card — as you can see I am way behind with not much time left to finish (not sure I will). GinaK Design penquin colored with copics; GinaK sentiment; Spellbinders Card Creator (Ribbon Threader); Four gems added in corners. 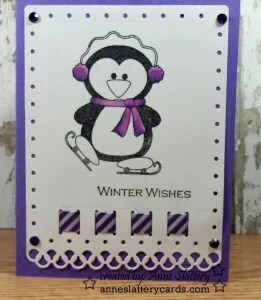 Grape Jelly cardstock from MFT. Thanks ladies for all your hard work on these challenges. I truly enjoyed them. I see you made TWO thank you cards – awesome! The second one with that gorgeous background is my favorite, and I bet is just stunning in real life. Thanks for TGIF’ing with me this weekend! I love your Red, White & Blue birthday card, you rocked the challenge! Thanks for participating in my challenge! 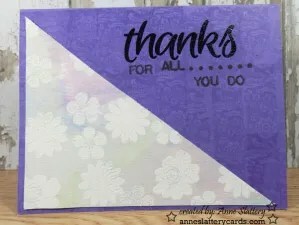 I also LOVE your colorful background card!